This shed from Waltons 10 x 6 Tradesman Apex Shed is a fantastically large storing area that is safe and secure and is weather resistant. Large double doors open out into the interior space, making movement in and out of this shed easy when storing and retrieving items. The windows allow light to flood into the shed, so no need to install an outdoor light to find your items. Styrene glazing is used as a safer alternative to traditional glass as it is 100% shatterproof, perfect for busy gardens and allotments. The windows can be installed on either the left or the right of the shed depending on the layout of your garden. Your items will be kept safe and protected against the weather elements as our 12mm tongue and groove cladding and 27mm x 27mm framing interlock together to make this building strong and sturdy. Heavy duty mineral felt comes included to keep the building dry as it helps to protect against any water damage and rotting. A pre-fitted lock and key will keep your items secure. I am so pleased that you are happy with the quality of your tongue and groove shed and I thank you again for your much appreciated feedback! Review:Window sills out of shape and windows very thin not a good fit. Review:Exceptional value for money. Only criticism is the windows are very flimsy, will have to replace them with stronger plastic ourselves. Review:Not as robust as expected but will serve its purpose. Thank you very much for your great feedback, I hope you enjoy your new Tradesman Shed for many years to come. 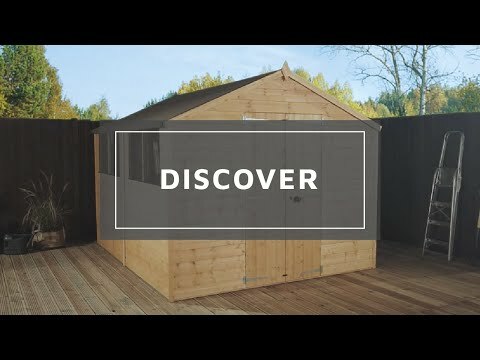 Review:Very happy with the quality of the shed. Our Reply:Thank you for your fantastic review and I am happy to know that you are pleased with the quality of your tongue and groove shed. Review:She'd arrived damaged and waiting for replacement to be installed. Very long wait for delivery of first shed. Review:A few hiccups with lining things up. Not very well cut in places. Fortunately our builder was resourceful but overall satisfied. Our Reply:I am glad that you are satisfied overall and apologise for any inconvenience caused with parts. Should you have any further queries, please do not hesitate to contact us on 01636 880514.
Review:Generally what I expected. However, the plastic trims for the bottom of the windows are badly twisted and distorted making the sealing and weathering of the styrene sheets impossible.